You are here: Home � All Deals , Media: Books Movies Magazines MP3s � The entire HBO series: Rome now on sale for $40. The entire HBO series: Rome now on sale for $40. 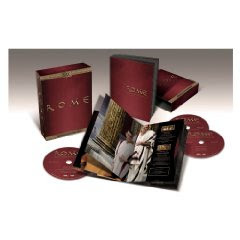 Amazon.com is selling Rome: The Complete Series on sale for $40. This series ran two seasons, and had an unprecedented budget for a TV series. The show chronicles Caesar, Mark Anthony, Cleopatra, and other notable historical figures of Rome in that period. But the show isn't solely about them. It also features common plebes as main characters. In short this is one of the better HBO series they ever made. If you want a comparison I would call Rome a better version of the now popular show The Tudors. Though my wife disagrees! If you are wedded to getting the Blu-Ray version instead of the DVD version, that is also on sale by Amazon.com for $60 as opposed to $40.